Entry in the 2011 Urban Water Design Challenge, sponsored by Visualizing.org and Circle of Blue. Nitipak and Austin submitted this information graphic for the 2011 Urban Water Design Challenge—sponsored by Circle of Blue and Visualizing.org. 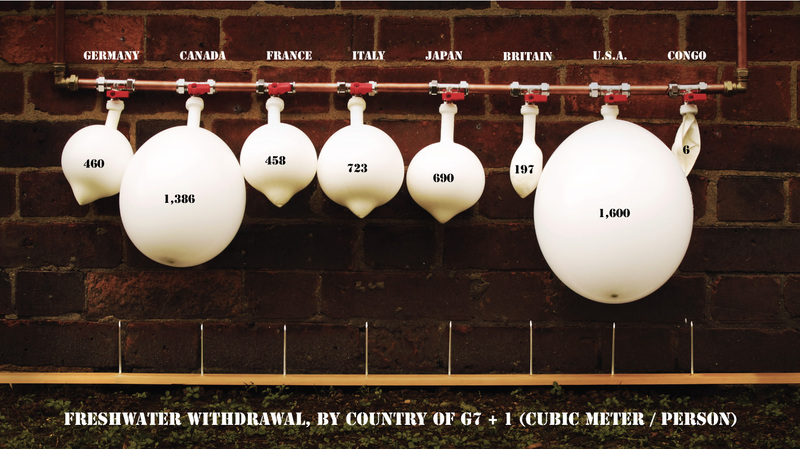 This infographic visually and physically describes the freshwater withdrawal per capita from the G7 and another nation. View the infographic in a new window. Click to enlarge. See the other winning designs here. Did you miss your chance to participate? Designers can continue to share their visualizations throughout the year by uploading to visualizing.org. The Stream, April 15: Regulating the Natural Gas Industry Federal Water Tap, April 18: Energy in the Western U.S.